Sage advice. Difficult to live by. It came from Jeremy Ford, best friend and hiking companion of Nathan Bartlett’s adored older brother, Neil. Nathan is the main character of On Chocorua, the first book of my new Trailblazer series. Jeremy offered this advice after college freshman Nathan had done an extremely foolish thing that had nearly ended his life. Nathan’s first mountain. And mine. All three of the books that will make up the Trailblazer series have personal meaning for me. I used to do a lot of mountain climbing, before an injury left me unable to claim any more peaks. Chocorua was my first. I went on to scale Madison, Liberty, Lafayette, Canon, Hight, and few other New Hampshire mountains. I struggled to the peak of Mount Katahdin in Maine, the final peak on the Appalachian Trail. I’ve hiked in California, New Mexico, Acadia, Hawai’i, Austria, Italy, and Switzerland. I’ll hike no more. But I still have the stories. A hike without a mountain. A spiritual journey. I experienced a spiritual bond with the universe on all my climbs. But the most affecting, the deepest connection, came to me on the island of Kaua’i. Even now, in my mind, I can plant my feet in the sand and on the rocks at Ke’e Beach on Kaua’i’s northwest corner, at the northern end of the Kalalau Trail. I hear the rush of the unpredictable, capricious ocean behind me as I gaze through the misty air down the Na Pali coast, where green-clad knife edges of land thrust from great heights and plunge into the surf. In this land where life and death exist in harmonious conflict, Nathan will meet people who hiked along the Na Pali coast and then could not leave: the Kalalau outlaws. On Mount Desert Island in Maine, in Acadia National Park, the mountains are not especially high. But they have challenges and rewards of their own. As on Kaua’i, the land rises out of the ocean without providing much flat space for beaches. One beach is called Sand Beach because it’s the only sandy beach to be found. Here, though, the land is not covered in lush green, but in New England granite. The brilliant blue of the sky, the deep marine of the sea, the dark green of the pines all work together to take your breath away. 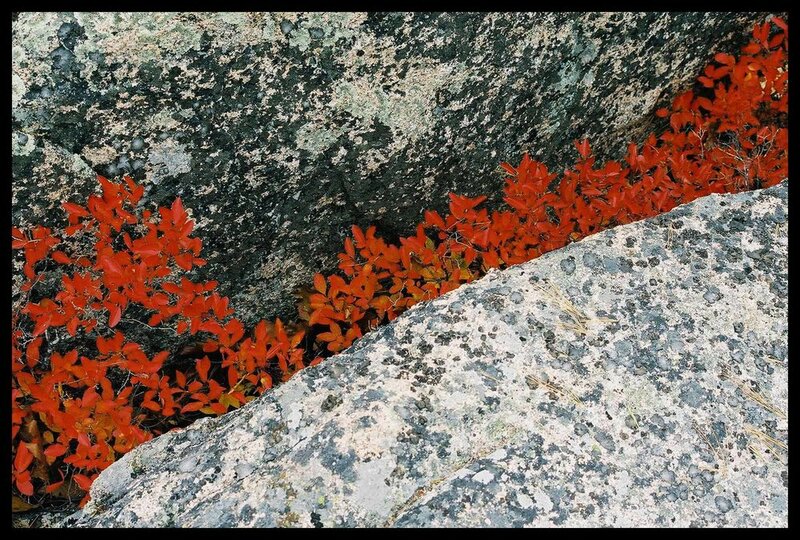 In the fall, blueberry bushes clinging to granite outcroppings create crazed lines and patterns of brilliant orange and deep red, in startling contract to the grey-brown of the rock. One mountain I’ve climbed in Acadia, Champlain, has a trail ascending its western slope. At the top, I have looked down the eastern side of the mountain, over a terrifying descent known as the Precipice Trail, which has claimed the lives of several people who accepted its dare. Nathan will find himself here, on the precipice not only of the trail but also of his destiny. He will need to make a decision that will determine the direction his life will take. He will have to decide if the risk is worth it. Through the character of Nathan Bartlett, my Trailblazer series will take you on a journey of life. Walk with us.